Learn the essential basics of using solar power so you can understand your project. Planning your project begins with understanding the basics found in this section. Solar power works well for most items except large electric appliances that use an electric heat element such as a water heater, clothes dryer and electric stove – for example – or total electric home heating systems. It is not cost effective to use solar power for these items. Conversion to natural gas, propane or other alternatives is usually recommended. Solar power can be used to operate a gas clothes dryer (Maytag, etc) because the electrical requirement is limited to the drum-motor and/or ignito-lighter, but not a HEAT element for drying the clothes, for example. We recommend you also review our page Helpful Solar Power Glossary which will provide useful terms and General Construction Techniques for insight into energy efficient new construction or retrofitting energy efficient principles into your building project. Using solar power to produce electricity is not the same as using solar to produce heat. Solar thermal principles are applied to produce hot fluids or air. Photovoltaic principles are used to produce electricity. A solar panel (PV panel) is made of the natural element, silicon, which becomes charged electrically when subjected to sun light. Solar panels are directed at solar south in the northern hemisphere and solar north in the southern hemisphere (these are slightly different than magnetic compass north-south directions) at an angle dictated by the geographic location and latitude of where they are to be installed. Typically, the angle of the solar array is set within a range of between site-latitude-plus 15 degrees and site-latitude-minus 15 degrees, depending on whether a slight winter or summer bias is desirable in the system. Many solar arrays are placed at an angle equal to the site latitude with no bias for seasonal periods. This electrical charge is consolidated in the PV panel and directed to the output terminals to produce low voltage (Direct Current) – usually 6 to 24 volts. The most common output is intended for nominal 12 volts, with an effective output usually up to 17 volts. A 12 volt nominal output is the reference voltage, but the operating voltage can be 17 volts or higher much like your car alternator charges your 12 volt battery at well over 12 volts. So theres a difference between the reference voltage and the actual operating voltage. The intensity of the Suns radiation changes with the hour of the day, time of the year and weather conditions. To be able to make calculations in planning a system, the total amount of solar radiation energy is expressed in hours of full sunlight per m², or Peak Sun Hours. This term, Peak Sun Hours, represents the average amount of sun available per day throughout the year. It is presumed that at “peak sun”, 1000 W/m² of power reaches the surface of the earth. One hour of full sun provides 1000 Wh per m² = 1 kWh/m² – representing the solar energy received in one hour on a cloudless summer day on a one-square meter surface directed towards the sun. To put this in some other perspective, the United States Department of Energy indicates the amount of solar energy that hits the surface of the earth every +/- hour is greater than the total amount of energy that the entire human population requires in a year. Another perspective is that roughly 100 square miles of solar panels placed in the southwestern U.S. could power the country. The daily average of Peak Sun Hours, based on either full year statistics, or average worst month of the year statistics, for example, is used for calculation purposes in the design of the system. To see the average Peak Sun Hours for your area in the United States, you can click the following link which will open a new window – just close it [X] when youre done to return here; U.S.-Solar Insolation Choose the area closest to your location for a good indication of your average Peak Sun Hours. So it can be concluded that the power of a system varies, depending on the intended geographical location. Folks in the northeastern U.S. will need more solar panels in their system to produce the same overall power as those living in Arizona. We can advise you on this if you have any doubts about your area. Solar panels, charge controller, battery and inverter. Solar panels charge the battery, and the charge regulator insures proper charging of the battery. The battery provides DC voltage to the inverter, and the inverter converts the DC voltage to normal AC voltage. If 240 volts AC is needed, then either a transformer is added or two identical inverters are series-stacked to produce the 240 volts. The output of a solar panel is usually stated in watts, and the wattage is determined by multiplying the rated voltage by the rated amperage. The formula for wattage is VOLTS times AMPS equals WATTS. So for example, a 12 volt 60 watt solar panel measuring about 20 X 44 inches has a rated voltage of 17.1 and a rated 3.5 amperage. Solar panels can be wired in series or in parallel to increase voltage or amperage respectively, and they can be wired both in series and in parallel to increase both volts and amps. Series wiring refers to connecting the positive terminal of one panel to the negative terminal of another. The resulting outer positive and negative terminals will produce voltage the sum of the two panels, but the amperage stays the same as one panel. So two 12 volt/3.5 amp panels wired in series produces 24 volts at 3.5 amps. Four of these wired in series would produce 48 volts at 3.5 amps. Parallel wiring refers to connecting positive terminals to positive terminals and negative to negative. The result is that voltage stays the same, but amperage becomes the sum of the number of panels. So two 12 volt/3.5 amp panels wired in parallel would produce 12 volts at 7 amps. Four panels would produce 12 volts at 14 amps. Series/parallel wiring refers to doing both of the above – increasing volts and amps to achieve the desired voltage as in 24 or 48 volt systems. The following diagram reflects this. In addition, the four panels below can then be wired in parallel to another four and so on to make a larger array. A charge controller monitors the batterys state-of-charge to insure that when the battery needs charge-current it gets it, and also insures the battery isnt over-charged. Connecting a solar panel to a battery without a regulator seriously risks damaging the battery and potentially causing a safety concern. Charge controllers (or often called charge regulator) are rated based on the amount of amperage they can process from a solar array. 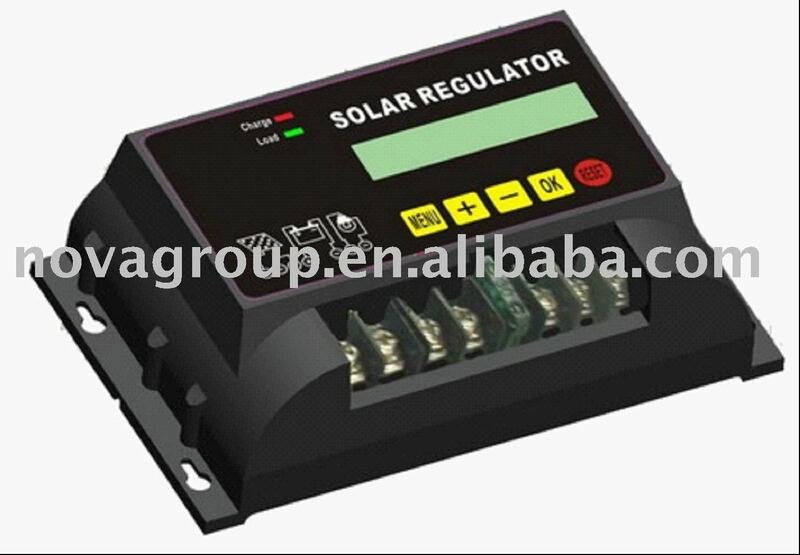 If a controller is rated at 20 amps it means that you can connect up to 20 amps of solar panel output current to this one controller. The most advanced charge controllers utilize a charging principal referred to as Pulse-Width-Modulation (PWM) – which insures the most efficient battery charging and extends the life of the battery. Even more advanced controllers also include Maximum Power Point Tracking (MPPT) which maximizes the amount of current going into the battery from the solar array by lowering the panels output voltage, which increases the charging amps to the battery – because if a panel can produce 60 watts with 17.2 volts and 3.5 amps, then if the voltage is lowered to say 14 volts then the amperage increases to 4.28 (14v X 4.28 amps = 60 watts) resulting in a 19% increase in charging amps for this example. The battery should have sufficient amp hour capacity to supply needed power during the longest expected period “no sun” or extremely cloudy conditions. A lead-acid battery should be sized at least 20% larger than this amount. If there is a source of back-up power, such as a standby generator along with a battery charger, the battery bank does not have to be sized for worst case weather conditions. The size of the battery bank required will depend on the storage capacity required, the maximum discharge rate, the maximum charge rate, and the minimum temperature at which the batteries will be used. During planning, all of these factors are looked at, and the one requiring the largest capacity will dictate the battery size. One of the biggest mistakes made by those just starting out is not understanding the relationship between amps and amp-hour requirements of 120 volt AC items versus the effects on their DC low voltage batteries. For example, say you have a 24 volt nominal system and an inverter powering a load of 3 amps, 120VAC, which has a duty cycle of 4 hours per day. You would have a 12 amp hour load (3A X 4 hrs=12 ah). However, in order to determine the true drain on your batteries you have to divide your nominal battery voltage (24v) into the voltage of the load (120v), which is 5, and then multiply this times your 120vac amp hours (5 x 12 ah). So in this case the calculation would be 60 amp hours drained from your batteries – not the 12 ah. Another simple way is to take the total watt-hours of your 120VAC device and divide by nominal system voltage. Using the above example; 3 amps x 120 volts x 4 hours = 1440 watt-hours divided by 24 DC volts = 60 amp hours. Sine wave inverters can virtually operate anything. Your utility company provides sine wave power, so a sine wave inverter is equal to or even better than utility supplied power. A sine wave inverter can “clean up” utility or generator supplied power because of its internal processing. Inverters are made with various internal features and many permit external equipment interface. Common internal features are internal battery chargers which can rapidly charge batteries when an AC source such as a generator or utility power is connected to the inverters INPUT terminals. Auto-transfer switching is also a common internal feature which enables switching from either one AC source to another and/or from utility power to inverter power for designated loads. Battery temperature compensation, internal relays to control loads, automatic remote generator starting/stopping and many other programmable features are available. In all systems there are losses due to such things as voltage losses as the electricity is carried across the wires, batteries and inverters not being 100 percent efficient, and other factors. These efficiency losses vary from component to component, and from system to system and can be as high as 25 percent. Thats why its a good idea to speak to someone who has extensive design experience – like us! – to properly configure the right equipment for you. IF YOU HAVE READ AND BASICALLY UNDERSTAND ALL THE SECTIONS ABOVE, THEN YOU CAN BEGIN PLANNING OF A POWER SYSTEM USING SOLAR POWER.